Mathematics Design Collaborative provides teachers with Formative Assessment Lessons to engage students in a productive struggle that builds fluency with their procedural skills, and deepens mathematical reasoning and understanding. MDC provides teachers with Formative Assessment Lessons (FALs) to engage students in a productive struggle that builds fluency with their procedural skills, and deepens mathematical reasoning and understanding. Developed in partnership between the Shell Center for Mathematical Education at the University of Nottingham, England, and the University of California at Berkeley, FALs align with content covered under the Pennsylvania Core Standards for Mathematics. They challenge students to put concepts into practice. The primary focus of the lessons is the use of the 8 Standards for Mathematical Practice, which is emphasized in our state’s content standards and assessment anchors. Research has shown that formative assessment lessons are a powerful way to improve student learning and performance. This approach allows students to demonstrate their prior understandings and abilities in employing the mathematical practices, and involves students resolving their own difficulties and misconceptions through structured discussion. The result is more secure long-term learning, reducing the need for re-teaching that otherwise takes so much classroom time. Students take more responsibility for their own work. Students engage in a productive struggle with rich challenging tasks. Resolution comes only gradually through interactions and discussion in the lesson as students gain new facets of connected understanding. Students study fewer tasks, but in greater depth. They are asked to draft solutions, compare their approaches to others and redraft their ideas as a result of their discussions. The teacher’s role is to prompt students to reflect and reason through their ideas. Teacher questioning is central to support students’ thinking and depth of knowledge, and student growth. The teacher’s role is not to provide answers and solutions. 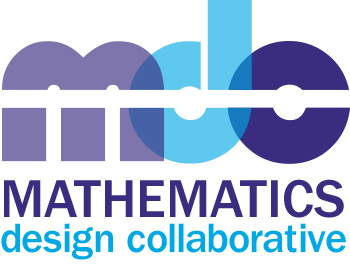 In January 2014, BCIU in partnership with CAIU was awarded a contract under the Race to the Top Grant to research MDC, develop a training plan, run a pilot group, and ultimately implement the Mathematics Design Collaborative (MDC) across Pennsylvania during the 2014-15 school year. This past spring a pilot group of 29 teachers/7 schools representing a variety of demographics from the BCIU-CAIU service areas completed the MDC training and implemented lessons in their classrooms. Teacher reflection summaries regarding their experience and student achievement data showed promising results. Many successes were evident but challenges also existed. Moving forward, these challenges will be addressed in future training and district preparation. Starting in September, MDC will be rolled out across the state through the 29 intermediate units supported by the MDC Task Managers at BCIU and CAIU.